A once in a lifetime event in Barcelona at the CCCP, an exhibition featuring the work of Ladislas Starewitch, Jan Svankmajer and the brothers Quay. This week in Barcelona, Spain (perhaps one day Catalunia) there is a remarkable museum exhibition opening at the Centre de Cultura Contemporània de Barcelona aka the CCCB. 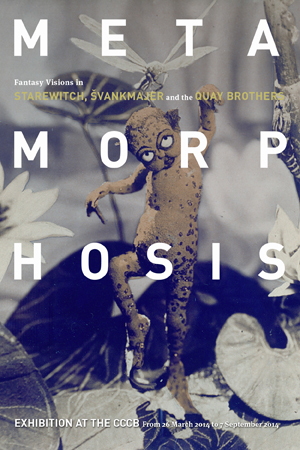 It is entitled Metamorphosis: Fantasy Visions in Starewitch, Švankmajer and the Quay Brothers. I entitled this little essay the ‘ultimate’ puppet animation exhibition. I suppose a stickler could imagine a much more complete museum show than this. A show that features the works of Willis O’Brien, Ray Harryhausen, Jiří Barta, Jiří Trnka, George Pal, etc etc. Nevertheless a show that features Jan Švankmajer, The Brothers Quay and Ladislas Starewitch (I’m using the French spelling) is pretty gosh darned ultimate in my book. Especially since Švankmajer, the Quays, and Starewitch’s granddaughter and estate caretaker Leona Martin-Starewitch will all be there to discuss their work. I know from personal experience that none of them make the regular promotional rounds. Essentially this is pretty much going to be a once in a lifetime opportunity. And I’m stuck in Alaska! It was my dearest hope to get myself to Barcelona in time for the opening to use the footage for Gravity From Above. I was even invited to come by curator Carolina López, who had heard of this project. But alas the finances did not come through in time. But if you find yourself taking a European tour sometime before September 7th, make sure to schedule a trip to Barcelona to see this singular exhibit. Meanwhile April is a month of waiting for Gravity From Above, as I am due to hear about two serious sources of funding for the rest of the expedition by the end of the month. Thanks for continuing to follow this story. This entry was posted on March 25, 2014 by The Anadromist. It was filed under Animation, Art, Barcelona, Brothers Quay, Catalonia, CCCP, Czech Puppets, Czech Republic, Documentary, Владисла́в Старе́вич, European Travel, Film, Gravity From Above, Jan Svankmajer, Ladislas Starewitch, Ladislaw Starevich, Ladislaw Starevitch, Leona Beatrice Martin-Starewitch, Puppet Documentary, Puppet Film, Puppetry, Spain, Symbolism, Uncategorized, Władysław Starewicz and was tagged with Animation, Brothers Quay, Czech Puppetry, Gravity From Above, Jan Svankmajer, Ladislas Starewitch, Museums, Puppet History, Puppets.